to their cult classic Zoolander. The news cracked the top 10 on trends for that day as searchers looked for videos of Stiller and Wilson strutting their stuff in full Zoolander and Hansel persona. One thing is clear: Blue steel is back in season. You know who else is excited right now? College kids, thanks to a little annual tradition called spring break. Students are all packed up and ready to hit the sun-drenched beaches of Panama City and South Padre Island, and searches for last-minute destinations and travel suggestions are heating up. Ferguson, Mo., is in the headlines again, and the reasons aren’t getting any better. First, the city’s police chief resigned following an investigation into his department that found evidence of racism. Then, two police officers were shot and injured during a demonstration at the Ferguson Police Department. Both officers are out of the hospital, but no arrests have been made, and protests are erupting in a city still traumatized by recent events—stirring people to get on the web to find the latest updates and causing sustained interest in the small city. 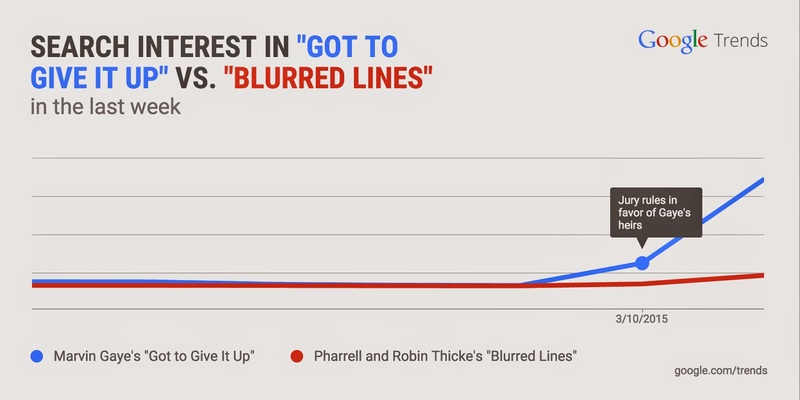 Musicians Robin Thicke and Pharrell Williams were found guilty of plagiarism after a jury determined that the duo infringed on soul singer Marvin Gaye’s track “Got to Give it Up” in 2013’s summer jam “Blurred Lines.” The artists were hit with a whopping $7.4 million fine and generated 200,000+ searches. Some are already deriding the decision as a vote against creative expression and a terrible precedent to set for the music industry. But the fight is far from over as both Thicke and Williams plan to appeal the verdict. This spring break, skip the overpriced frozen pina coladas and jello shots and make your own cocktails with help from Google. Just say, “Okay Google, how do I make a Snakebite?” and you’ll be making tips in no time. This week, runways, verdicts and diapers were the the talk of the town on search. Read on to learn more. “Dude, where’s my baby changing table?” That’s what actor Ashton Kutcher was wondering on social media after he observed a lack of diaper-changing facilities in men’s restrooms. Kutcher offered to give a shout-out on his Facebook page to the the first business he could find with diaper-friendly bathrooms. While the actor’s call to arms might not move the needle in terms of shifting societal perceptions on parenting, it did get the celebrity trending on the search charts. Peering into our search crystal ball, we think we see a little more breakdance fighting in our future. 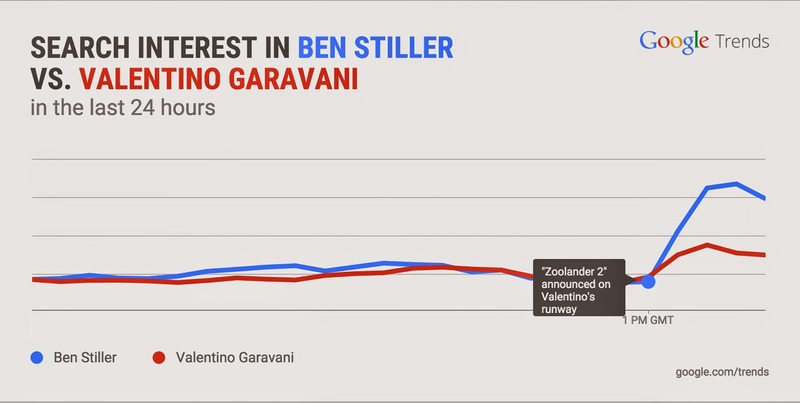 This past Tuesday, actors Ben Stiller and Owen Wilson surprised fans and fashionistas everywhere when they unexpectedly took to the catwalk during Valentino's display for Paris Fashion Week—all just to announce the sequel to their cult classic Zoolander. The news cracked the top 10 on trends for that day as searchers looked for videos of Stiller and Wilson strutting their stuff in full Zoolander and Hansel persona. One thing is clear: Blue steel is back in season.